The European champions were 1-0 winners in the Confederations Cup this evening. PORTUGAL WENT TOP of Group A at the Confederations Cup following a 1-0 win over Russia — Cristiano Ronaldo making the difference for the European champions. The Real Madrid star found the net after just eight minutes, beating goalkeeper Igor Akinfeev with a strong header from close range, and Stanislav Cherchesov’s side were unable to find a response. Russia were high on confidence following their 2-0 win over New Zealand, whereas morale was somewhat low in the Portugal camp after they conceded a late equaliser in a 2-2 draw with Mexico. It was all Portugal in Moscow, though, and Ronaldo eventually led his side to victory amid a tumultuous personal period off the pitch. The 32-year-old has been linked with a move away from Madrid following scrutiny over his tax affairs in Spain. Fernando Santos’ men now meet New Zealand on Saturday in their final game of the group stage, while Russia face Mexico on matchday three. Portugal made an encouraging start to the game and went a goal up in the ninth minute via Ronaldo, the Real Madrid star escaping the attention of Fedor Kudriashov at the far post before heading home from close range following a fine cross from Raphael Guerreiro. Ronaldo continued to cause the Russian defence all kinds of trouble in the opening stages and he was unfortunate not to double Portugal’s lead at the half-hour mark, Akinfeev pulling off a superb save to deny the forward from six yards out after a rapid counterattack. The hosts first threatened late in the first half when Aleksandr Golovin reached Fedor Smolov with a low cross from the right, only for the Krasnodar star to aim his left-footed effort well wide of the Portugal goal. New AC Milan signing Andre Silva could have added his name to the score sheet shortly after the break when he beat his marker to Cedric Soares’ cross from the right, but Akinfeev miraculously kept out the striker’s header with a stunning reflex save to keep Russia’s hopes alive. 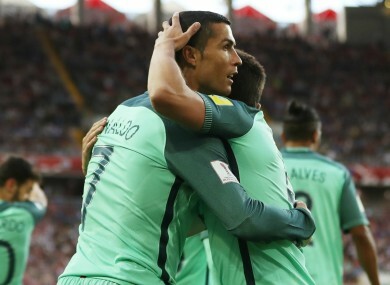 Portugal kept on pushing for a second and Ronaldo should perhaps have doubled his tally after being set up by Andre Gomes at the hour mark, mistiming his header and sending the ball well wide of the target instead, before he wildly blasted a shot over the crossbar minutes later as the game started to open up. It mattered little in the end, though, as Russia lacked the individual quality to really worry Portugal goalkeeper Rui Patricio, the Seleccao seeing out a flurry of late pressure without any noteworthy problems. Email “Prolific Ronaldo proves the difference as Portugal pour misery on hosts Russia ”. Feedback on “Prolific Ronaldo proves the difference as Portugal pour misery on hosts Russia ”.